An east coast community is remembering six lifeboatmen who lost their lives when their boat was overwhelmed by the sea 60 years ago. A church service will be held in Arbroath and a wreath laid at sea. The lifeboat Robert Lindsay had only served three years at Arbroath when the waves claimed it on 27 October 1953. The boat had been on a fruitless search for a vessel in distress and when it was overcome by heavy seas just a quarter of a mile from the harbour. 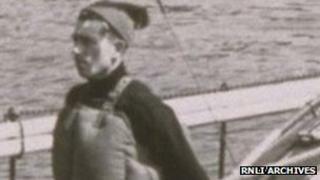 The only survivor was Archibald Smith, who was able to hold on to a rope thrown across the boat by watchers on land. David Bruce, Harry Swankie, William Swankie, Thomas Adams, David Cargill and Charles Cargill all died in the tragedy. They came from the town's fishing community and hardly a family from it was left untouched by the tragedy. In Arbroath, 60 years to the day their lifeboat and crew were taken they will gather for a church service to remember them. The town's present lifeboat will sail out of the harbour to lay a wreath on the sea in their memory. Alex Smith, the lifeboat operations manager at Arbroath, said: "It is the darkest day in our history here at Arbroath lifeboat station and the sacrifice of those lost has been, and continues to be, an inspiration to generations of crewmen. "Unfortunately, it also serves as a stark reminder of the risks that volunteer lifeboat crews face to help others at sea."